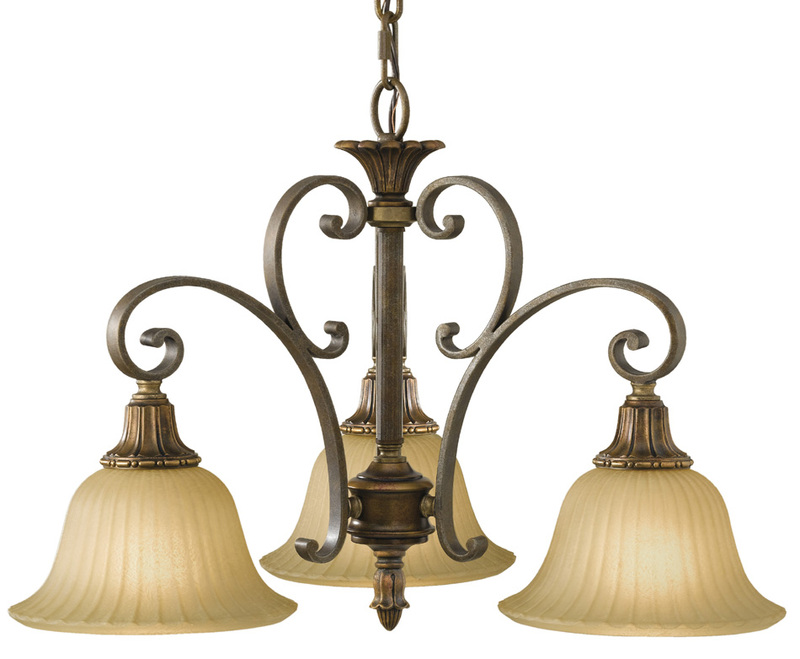 This Feiss Kelham Hall British bronze finish 3 light downward chandelier with Scavo glass shades is classic and features a detailed ceiling mount, chain suspension and central rod featuring a feather top sconce, detailed casting and lower acorn finial. Three scrolled ironwork arms are attached to the column, with ribbed shade fitters and large downward facing fluted and ribbed India Scavo glass shades. Charming design, exquisite taste and classic detail inspire this European style collection. Stunning curved arms are hand finished with delicate features. India Scavo glass blooms at its opening to create a lovely glow. A lovely three-light downward facing chandelier suitable towards Edwardian and traditional influences. Supplied with 152cm of chain that can be shortened at the time of installation to suit your ceiling height; please see the technical information below for exact dimensions. This classic light is supplied by Elstead Lighting and designed in the USA by Feiss, founded in New York in 1955. They have become well known over the years for their contemporary yet classic styling, quality and great original designs such as the Kelham Hall British bronze finish 3 light downward chandelier with Scavo glass shades you see here.